The previous Roundup, April 2012/1 is here. March 2012/2 is here and earlier editions are indexed here. Im pleased to report that I have it on excellent authority that the irrational pricing policy at classicsonline.com for EMI and Virgin budget-price albums is at long last about to be sorted. Some of the most recent additions seem already to have benefited from the change: 77 minutes of arias and choruses from the Wolfgang Gönnenwein recording of Bachs St Matthew Passion, a recommendable compromise between traditional and period-aware performances, for just £2.99  here  for example. 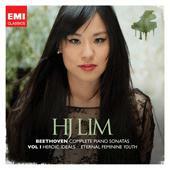 * The new 2-CD recording of Beethoven Piano Sonatas by rising star HJ Lim is also offered at the competitive price of £7.99  here  thereby exactly matching the price of the download from hmvdigital.com, which is also offered at 320kb/s. ** For the time being, however, its still caveat emptor for the older releases, especially of the budget 2-CD sets. * hmvdigital.com have the complete 3-CD set of this St Matthew, still well worth considering, for £7.99  here. ** amazon.co.uk undercut both at £7.49 and throw in the pdf booklet, but their bit-rates are usually lower, at a maximum 256kb/s. This could just as appropriately have been my Discovery of the Month  both works receive their world premiere recordings here. Music and performances are every bit as good as the Recording of the Month accolade implies; not having heard either work before, I was purchasing blind. If youre hesitating, theres no need to do so. Dont those wonderful Dutton covers just make you want to take the plunge, quite apart from other considerations? A slight disappointment: the bit-rate is around 225kb/s rather than the anticipated 256kb/s, when the full 320kb/s is rapidly becoming the norm, but fortunately the recording doesnt seem to suffer. The strong documentation to which Rob Barnett refers is not part of the deal, but his review largely helps to mitigate its absence. At £6.23, the amazon.co.uk download undercuts the iTunes version (£7.99) and the CD (the cheapest UK price seems to be £9.49). Amazon, who have the inexpensive download are asking a ridiculous £23.90 for the CD at the time of writing! For just £4.74 and at the full 320kb/s bit-rate, too, this makes a better bargain even than the other Dutton recording of Lionel Sainsburys music which Ive selected as Download of the Month  you may wish to look out to see if that also appears on hmvdigital.com. 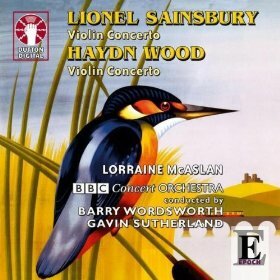 As with the Sainsbury/Wood coupling on the Violin Concerto album, theres no sense that the newer work is in a style that clashes with its older companion from nine decades previously, though that doesnt mean that its written in a derivative manner. For all its virtues, however, its the Foulds that really makes this special; weve long awaited a recording of this work. I have no benchmarks but I doubt if these landmark recordings will ever be bettered. Full marks for both these recordings. There are no sleeve-notes, but youll find an excerpt from them on the Dutton website here. Not all the music here is exactly contemporary, which may actually enhance its appeal for some  there are tracks by Benjamin Britten from an album Britten on Film and by Malcolm Arnold, for example. Nor is all the contemporary music too avant-garde: the opening piece, for example, based on the Song of Solomon, is very approachable. Its the first part of a four-part setting, itself part of an enjoyable programme of Howard Skemptons Choral and Chamber Music which I streamed from Naxos Music Library. Barry Guys After the Rain is appealing to the general listener, too  the complete work takes up a short album. Ed Bennetts album My Broken Machines, from which Cartoon is taken, is a different matter  NMC aptly use the term anarchic. Judith Weirs El Rey de Francia, from a 2-CD set of her music, is also a predictably tough-ish nut to crack. I hadnt heard Malcolm Arnolds Severn Bridge Variations, the brief opening section of a collaborative effort with several other composers, including Michael Tippett and Grace Williams from an album entitled Themes and Variations. These are not all recent recordings  After the Rain was recorded in 1993, for example  but they may well tempt you to explore. If you buy just one album on CD or as a download the sampler will have served its purpose. 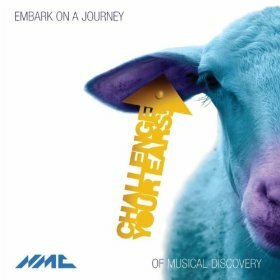 Alternatively, you could explore the NMC catalogue further with another sampler, New Stock, available as a download in mp3 (£1.99) or flac (£2.99) from nmcrec.co.uk. All the music on both samplers is available for download in mp3 and flac from NMC or classicsonline.com or can be streamed and the booklets accessed from Naxos Music Library. Amazon.co.uk might have done NMC better service by identifying the composers  only three are named; I had to chase up the rest. This recording is scheduled for release on CD in May 2012 but is available in advance for download; my review is based on the lossless version. Oxford Camerata/Jeremy Summerly  rec.1993. DDD. Anyone who likes English polyphony should get this CD which is most attractively priced. (See review for details.) 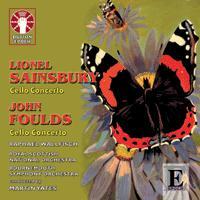 The Naxos recording has been a valued part of my CD collection since it was released almost twenty years ago. It would seem, with two such strong rivals for half the price, that the new Hyperion needs to be especially good to justify itself. I think that there is enough that is distinctive to recommend it: the inclusion of Tyes other masterpiece, the Western Wynde Mass (though I must point out the availability of this work on an inexpensive Gimell set listed below); the interspersing of the Latin and English works and, not least, the generous playing time. In many ways its the inclusion of the English settings that is most instructive, since there is so little difference in style between the two, partly because Tyes Latin settings are less florid, less elaborate than those of his contemporaries. In comparison Talliss English settings sound a pale imitation of their Latin counterparts; it was not until Byrds Great Service, Second Service and English anthems that Tyes talent in both languages was rivalled and exceeded. Im not sure that Tyes setting of the Easter anthem Christ rising from the dead, which here receives a powerful performance, doesnt match Byrds English setting of the same text of which youll find several versions on YouTube. They are not really comparable, since the Byrd 6-part setting with viol accompaniment is more domestic in tone  theres a good recording of this and other music, vocal and instrumental, by Byrd performed by Red Byrd and the Rose Consort on Naxos 8.550604. The English setting of Nunc Dimittis is odd in that the text doesnt correspond to that in any version of the Book of Common Prayer. It predates even the first Book of 1549 and shows the composers way with English texts at an early date. The simplicity of the setting and the sympathetic performance which it receives means that it rounds off the programme quietly and very effectively. The Euge bone Mass fits the reformers desire for one note per syllable so well  a rule also formulated by the Roman Catholic Council of Trent  that its impossible to say when it was composed: in the latter part of the reign of Henry VIII or in that of Edward VI, Mary or Elizabeth. The Naxos notes suggest that of the young reformer King Edward, whose tutor was Tyes younger contemporary Mundy, for the Mass and the associated quæsumus omnipotens Deus  yet the Naxos recording is the only one of the three not to include that work for comparison. Like many Tudor settings, Tyes Euge bone Mass comes without Kyries, perhaps in this case because these had been replaced in the Book of Common Prayer by the Ten Commandments. It was usually assumed that these would be chanted, though, paradoxically, Taverner composed a separate polyphonic setting of them, not attached to any complete Mass, the Kyrie Leroy. (Find it sung by The Tallis Scholars with Taverners Missa Gloria tibi Trinitas, etc., on Gimell CDGIM004  or stream from Naxos Music Library). One reason for this common omission may have been the late medieval tendency to introduce farced tests, often very elaborate, into the simple nine-fold Kyrie eleison-Christe eleison. Several of these are included in the Sarum Missal. ODonnell simply performs what Tye sets as part of the Euge bone Mass but Summerly includes a separate setting of the Kyrie and Hill begins with a setting of one of those farced setting, Kyrie orbis factor. In this respect, the new recording is less instructive than the two older ones. That Euge bone comes in tandem with the Western Wynde Mass on the new Hyperion, however, swings the balance in the other direction. The performance rivals that on Gimell; in a sense they are not in competition because, as you would expect, a cathedral performance with boys voices on the top line is different from that of a small professional group. With Tyes reformist tendencies, too, its appropriate that Hyperion have recorded the music at Westminster Abbey rather than the Cathedral. As you might have expected, James ODonnell takes the music at a faster pace than Peter Phillips with the Tallis Scholars but you would never notice the difference unless you played them serially, a silly game which reviewers have to play. Even then I certainly couldnt say that one was unduly fast or the other unduly slow. That Gimell recording of the Western Wynde Mass which Ive mentioned is on The Tallis Scholars sing Tudor Music (I), Gimell CDGIM209, 2CDs for 1  see my review for details. Like the two budget-price recordings of the Euge bone Mass it sets a very high standard against which the new recording has to compete and it comes in the company of equally splendid recordings of the music of Tyes contemporaries. In fact, its so good that youll probably want to purchase the companion 2-CD set of the music of later Tudor composers too (CDGIM210, reviewed jointly with Volume 1). If its the two Tye Masses together and in the company of his little-performed English-texted music that you want, however, the new Hyperion recording is unrivalled. If you prefer boys voices, thats an added advantage. With very good recording in an ideal acoustic and notes of the usual high Hyperion quality, you wont be disappointed. Even the cover merits special mention  Christ holding the world in His hand, as in the vision of Julian of Norwich, from the Westminster Retable. So, despite the strong competition, this has strong claims of its own. Its a little late for Easter Sunday, but it should still be what we used to call Paschal tide when you read this review. This is a world premiere reconstruction of a Lutheran Easter Mass as prescribed by the conservative Braunschweig-Wolfenbüttel liturgy of 1569. Its billed as the first volume in a series, Renaissance in the North, to the continuation of which I look forward. If you have heard the DG Archiv reconstruction of a Christmas Mass with music by Prætorius, as performed by Paul McCreesh*, you should know what to expect here  containing music as rich as any written to accompany the Roman rite; with instrumental accompaniment, its Italianate in style and much more elaborate than the limited polyphonic settings in use in England at the time in the established church or by Catholic recusants, this is the musical equivalent of a blow-out meal. Ive not yet received my download of this from classicsonline.com but the Naxos Music Library streamed version sounds fine. The promised pdf booklet of notes failed to materialise from the Naxos Music Library, but youll find some information in German and English on the CPO website  here. Both classicsonline.com and hmvdigital.com misprint the final track, Hæc est dies, as Haec edt dies, which suggests that the careless typo stems from CPO  not what one expects from them. * the DG Archiv CD appears to be deleted: download from hmvdigital.com  here. These suites from three of Lullys operas are taken from the 4-part arrangements published by Estienne Roger between 1697 and 1712, which is how Lullys music came to be known outside France. They should appeal to any lovers of French baroque music, even those not especially enamoured of singing  its Lully without tears, as it were, for them. With excellent performances  different instrumental figurations for each of the operas  and recording and a valuable set of notes, this is strongly recommended. If only Tudor had given us a more interesting cover  like that of the Naxos recording listed below, for example  all would have been perfect. For further listening, try an attractive and inexpensive Naxos collection of Ballet Music for the Sun King performed by the Aradia Ensemble and Kevin Mallon (8.554003 [73:19]  from classicsonline.com  no overlap with the Tudor recording). Those wishing to explore Lullys opera-ballets more fully might well start with a 2-CD slightly abridged version of Phaëton on the budget Warner Apex label directed by Michel Laplénie and Mark Minkowski (2564621842). Back in the day, you were either a Lully or a Rameau supporter but today we can enjoy the music of both. 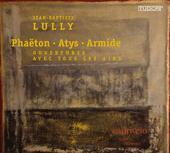 An enjoyable recent 2-CD set celebrating the tenth anniversary of Le Concert dAstrée includes excerpts from one Lully opera, Thésée, together with music from four Rameau works, plus music by Purcell and Handel. Watch out for my review on the main Musicweb International pages (Virgin Classics 7307992, around £13 in the UK or download for £8.99 as 5099973079958 from classicsonline.com). Coro del Teatro Regio di Torino, Academia Montis Regalis/Alessandro de Marchi  rec. 2003? DDD. Wonderful music, if not much drama, in Vivaldis second opera and his first for Venice, based on Ariostos predecessor in the field of renaissance epic based on the deeds of Orlando, Boiardo. The performance and recording  in a good 320kb/s transfer  are all that could be desired. Theres no libretto but one can be found online and the price is a very generous £7.99 a third of the cost of the CDs or the classicsonline.com download, which is uncompetitive at around the same price as the discs. I actually downloaded it for £6.49, after which the hmvdigital.com price increased immediately! So why is this not my Bargain of the Month? Though I deleted my old copy of the HMV download manager and obtained the new version, I had to download this recording track by track from Google Chrome  a tedious process. Even more tedious  and downright annoying  was the fact that the tracks ended up in my download folder in a haphazard manner and required sorting and re-numbering, a hazardous process if youre not very careful, though you can always go back to my downloads and obtain the track again if you mess up. It was worth the effort, but you may prefer to buy the CDs. The Sinfonia in C, RV112, opens the proceedings and, as well as the complete opera, there are nine tracks of alternative arias, but without notes its not clear where these fitted. The new release shares the virtues of the earlier volumes: a period-size orchestra thats by no means defective in conveying the power of the music, such an essential feature of the Choral Symphony. With good recording, though no notes or texts, this is a version to challenge the best. The audience is barely perceptible until the well-deserved applause at the end. I also listened to the recording of Nos. 6 and 8 and enjoyed that too. Failoni Orchestra/Michael Halász  rec.1994. DDD. This is the least expensive way to obtain Joachims orchestration of the Grand Duo Sonata; though its no longer believed that this is a reduction of the so-called Gmunden-Gastein Symphony, now generally believed to be No.9, its an enjoyable work. The performance is sympathetic, though a shade less distinguished than the Abbado version, coupled with the Unfinished listed above. There are more recommendable versions of the Tragic symphony; the opening of the wonderful slow movement is just a little too matter of fact and the whole movement too brisk at 7:59. (Abbado and Böhm, both on DG, take a more leisurely 9:21 and 9:18 respectively). The alternatives, however, mostly come at a higher price and the difference is not so great as to make you regret the small outlay of £4.99 on this recording. Try it first if you can from the Naxos Music Library. Its good to see classicsonline.com including booklets for downloads of their own Naxos recordings  if you downloaded earlier and missed out on the booklet, its available from the Naxos Music Library. In this case they probably give too much credence to the suggestion that the Grand Duo was intended as a symphony, but they are still valuable. Alternatively, youll find notes about this recording here. Classicsonline.com also have the highly regarded Pentatone Netherlands CO/Nikolic coupling of Symphonies No.4 and 5 (PTC5186340  [67:23] here) and the classic London Mozart Players/Blech recording of the same coupling from 1952 for just £1.99 (9.80543 [64:54]  here  not available in the USA). Sample both from the Naxos Music Library if you can. For my money Nikolic and Blech are heartfelt but just a little too ponderous in the slow movement of No.4  just the opposite of the fast tempo that I dislike in Halászs performance, though more pardonable. The Blech recording is dated but more than bearable. Hmvdigital.com have Abbados Nos. 3 and 4 for £7.49; deutschegrammophon.com also offer a lossless download for £9.49. Orchestra of the Age of Enlightenment/Charles Mackerras  rec.1992. DDD. Only the bafflingly irrelevant cover causes any reservations. Forget it and enjoy these performances: No.5 is almost the equal of Beechams EMI recording (above) and the Unfinished comes with the sketch of the third movement stylishly completed by Brian Newbould and a credible finale from the Rosamunde music. Both these extra movements sit better with me than with Brian Reinhart, but those who dont like them can just edit them out. I especially like the way that Mackerras pushes the opening movement quite hard, thereby avoiding the common problem that we have a symphony of two slow movements  just about the only problem with the Abbado recording (above). The recording sounds well (320kb/s) and, though there are no notes, even those with the parent CDs in this series are pretty skimpy. The hmvdigital.com download is excellent value at £3.49, which takes care of Brian Reinharts only reservation, namely that the 2-CD set with the Ninth can be obtained on CD for little more than the single disc of Nos. 5 and 8. That twofer comes at exactly twice the price from hmvdigital.com, £6.99. The illogicality of download pricing is illustrated by the fact that classicsonline.com charge a competitive £3.99 for the single-CD download but an unfeasible £13.98 for the twofer  but see my opening comments on pending changes in this regard. 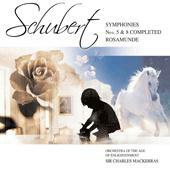 If the two extracts from Schuberts incidental music for Rosamunde have whetted your appetite for the complete thing, classicsonline.com have two recordings at a budget £4.99. Peter Maag recorded the music with the Philharmonia Hungarica for Vox on an LP issued on the Turnabout label (now on Musical Concepts MCS-ED-9102 [60:57]) and Willi Boskovsky with the Dresden Staatskapelle on an East German recording issued on LP by HMV (EMI) and now reissued by Berlin Classics (0090042BC [51:56]). Boskovsky includes both the real Rosamunde Overture, as performed originally, though intended for Alfonso und Estrella, and the Overture to Die Zauberharfe, which later took its place and has now come to be known as the Rosamunde Overture. Turnabout LPs at £0.99 were once staple fare for the impecunious but this one isnt in the running; with livelier tempi, better orchestral playing and recording, Boskovskys is the version to go for. Better still, though more expensive, hmvdigital.com offer the Abbado recording for £7.49. 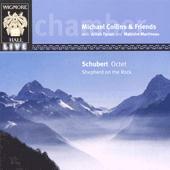 The Wigmore Hall recording is excellent value  not only does the download cost a mere £4.99 but the Octet comes with a substantial coupling in the form of one of Schuberts most striking and unusual works, the Shepherd on the Rock, with Michael Collins  also prominent in the Octet  providing the clarinet obbligato and Ailish Tynan a stylish soloist. The value wouldnt count for much if the performance had not been so good, but its one of the best available, though I think Collins and Friends 'milk the music and linger a little too much at times  and its well recorded. There are no notes, but thats no great problem for music so well known. The Gaudier Ensemble are also excellent value  £4.90 for the download at the time of writing, perhaps because the CD, rather surprisingly for such a highly rated performance and recording, is now available only from the Archive Service. I can only assume that the neglect of this version arises because are so many excellent recordings of the wonderful Octet, including the inexpensive version Music from Aston Magna on Harmonia Mundi*, listed above, that something has to give. Hyperions loss is your gain if the download remains at this very low price. This download does come with a book of words, though theres no filler. Push me hard and I lean towards this rather than the Wigmore Hall recording. That means doing without der Hirt auf dem Felsen  a good excuse for buying Arleen Augers performance on Volume 9 of Hyperions complete Schubert Lieder collection (Hyperion CDJ33009  see January 2010 Roundup). 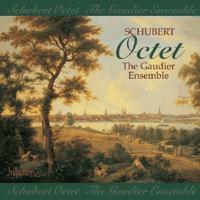 The performance of the Octet by the Academy of St Martin in the Fields Chamber Ensemble is also well worth considering, though one might have expected a reduction in price for a recording of this age: CHAN8585 [59:42]  from theclassicalshop.net in mp3 and lossless, or sample first from Naxos Music Library. Theres a pdf booklet available. * Still a bargain at £2.52 or less from emusic.com and a reasonable £4.49 from iTunes, but not such a bargain at £6.99 from amazon.co.uk and £7.99 from hmvdigital.com, especially as the latter is at a rate of only 192kb/s. 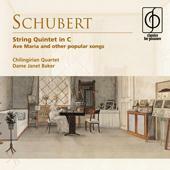 The Schubert Ensemble (Simon Blendis (violin); Douglas Paterson (viola); Jane Salmon (cello); Peter Buckoke (double-bass); William Howard (piano))  rec. November 2003. DDD. CHAMPS HILL RECORDS CHRCD007 [73:00]  from classicsonline.com (mp3) or stream from Naxos Music Library. My Trout Quintet of choice remains the Clifford Curzon/Vienna Octet recording, listed above in reviews of transcriptions from HDTT and Beulah  both recommendable, though neither can disguise the fact that the recording is showing its age in terms of very slightly dry sound. On a single CD its deleted, but you can also purchase the Eloquence recording as an mp3 (£5.49) or lossless download (£6.99) from deutschegrammophon.com. (467 4172 6, coupled with the Death and the Maiden Quartet). That very slight dryness is certainly not enough to deter me, however, though the more recent recordings listed above certainly sound better. The Hyperion Helios recording has much to offer, especially for those looking for an essentially lyrical view of the work which Sir Jack Westrup rather dismissively but not wholly inaccurately called holiday music for amateurs. For all my reservations, I enjoyed listening to the Schubert Ensemble of London (not the same group as the Schubert Ensemble on Champs Hill) in their namesake and I enjoyed hearing their account of the less well known Hummel even more. Its small beer after the Schubert  it might have been better to have placed it first, something which you can arrange yourself  but its still an enjoyable brew in this fine performance. With recording and notes of Hyperions usual high standard, this is well worth considering at the price. It wont be reduced to £4.20 for long, but its still good value at the regular £5.99. Reviewing the Champs Hill recording on CD  here  I thought it just a little too tidy  every note in place, like visiting a home that one used to live in thats been thoroughly spring-cleaned but doesnt seem lived in. If you have just heard the music for the first time, in concert or on the radio, and are looking for a first-rate version from which to explore it further, you could do much worse. Seasoned Trout-fanciers, however, will be looking for something a little more individual, something to challenge the best versions, all of which are prepared to take a few more risks. That remains my feeling; though I dont wish to imply that its not a good performance in its own right, I enjoyed the accompanying Trio much more. I see that Byzantion was a little more positive than me  see review. The beauty of a subscription to the Naxos Music Library is that it allows you to listen and judge for yourself before buying. Youll find many other tasty Trouts there, too  79 in all, though some are duplicates of the same recording. 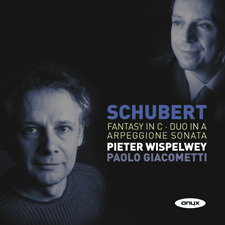 If neither of these recommendations is to your liking, there are two Australian Eloquence recordings which you may wish to consider, on CD only: Jörg Demus and the Schubert Quartet, with Dvořák on 480 0489  see review  and a 2-CD set featuring the Melos Ensemble and coupling the Beaux Arts Trio in the two Piano Trios on 442 9375  see my review. Since I wrote about these, Australian Eloquence CDs have become more readily available in the UK but also now more expensive  they and the few remaining European Eloquence discs are mid-price rather than budget  though single discs are still only £5.81 and the 2-CD set just £8.82 direct from Buywell in Australia. rec. 1981 (all items except those marked *); *1971. ADD, re-mastered 1996/1998. Whether youre looking for a good recording of the String Quintet  not quite as heartfelt as that with Casals listed above, but much better recorded  or a sample of the wonderful recordings of Schubert Lieder which Janet Baker made with Geoffrey Parsons and Gerald Moore, you wont go far wrong with the Classics for Pleasure. The CD which I reviewed in 2008  review  was very good value, but it seems no longer to be generally available; the download is even better value at £4.99 from classicsonline.com or hmvdigital.com (320kb/s) or £4.39 from amazon.co.uk (256kb/s, I assume). At the same attractive price classicsonline.com also have the Aeolian Quartet on Regis (RRC1278) which I mentioned in the review of the Classics for Pleasure CD, with a Mozart coupling and, in this case, the pdf booklet included. Youll find my review of the Regis CD here. 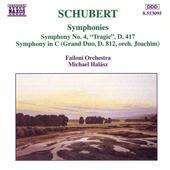 At the time of writing the Hyperion was even better value than either the CFP or the Regis  temporarily reduced to £4.20 to coincide with the BBC Radio 3 Spirit of Schubert series. Even at its normal price of £5.99, its still very competitive, especially if, very reasonably, you have already invested in one of EMIs more complete recordings of Janet Bakers Schubert. The single-movement String Trio comes first, so theres no question of anti-climax as there is with the other recordings  its an attractive work and it receives strong advocacy here, but its no match for the Quintet; I wouldnt quite classify it as a miniature gem, as Julian Haylock does in the notes, though hes spot-on in describing the Quintet as arguably Schuberts greatest chamber work  a contender as one of the greatest works in that genre of all time, I would add. Otherwise the notes set the Quintet very well in the context of Schuberts last year and the inner compulsion that seems to have motivated it and the last three piano sonatas. That inner compulsion is well realised in the Raphael Ensembles interpretation, especially in the heartfelt adagio. I didnt know this recording when I chose that movement for my mothers funeral  I see that Rubinstein had the same idea for his own  but I would have chosen it if I had. The Raphael Ensemble take 13:40 as against 14:32 from the Chilingirians and 15:31 from the Aeolians. That seems fast on paper  only the recording with Casals is faster, at 13:15, so why is it that I find the epithet of heavenly length, normally applied to the Ninth Symphony, appropriate to the Raphael performance of this movement? Maybe its because, as one reviewer of the original full-price issue noted, time seems to stand still here. Similarly, in the third movement the sheer exuberance of the scherzo and the inwardness of the andante sostenuto trio section are as well contrasted here as I have ever heard. I have no real reservations about the other versions that Ive mentioned, but the Raphael Ensemble go to the top of the tree of recent recordings for me, even rivalling that classic Casals recording. With first-rate sound and the excellent notes which Ive already mentioned, you need look no further. Belcea Quartet (Corina Belcea-Fisher, Laura Samuel (violins); Krzysztof Chorzelski (viola); Alasdair Tait (cello)) rec. Potton Hall, Suffolk, UK, 8-12 July 2002. DDD. I recommended the CD version of this budget-price recording  see review. The download from classicsonline.com is an even better bargain at £3.99, but check before buying: prices of EMI recordings from this source tend to change at the drop of a hat. * Illogically, both on CD and as a download, there are two other versions of this same recording at a higher price  make sure you choose the right one. Theres some overlap with the Belcea recording in the case of D87 and the download is more expensive, but theres a lossless option as well as mp3, not available for the EMI. 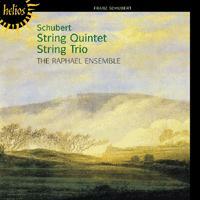 The early quartets, D112 and D173 are well worth having in these fine performances and the recording is excellent. For some reason which eludes me, the booklet can be saved from the Chandos CD page but can only be viewed, not saved, from their download page. Kodály Quartet (Attila Falvay, Tamás Szabó (violins); János Fejervári (viola); György Éder (cello))  rec. 2002. DDD. 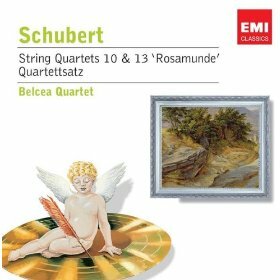 I mentioned this recording in my review of the Belcea Quartet CD of Nos. 10, 12 and 13 (above), and wrote about it in more detail in the April 2009 Roundup. 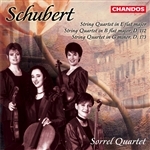 As in the case of their recordings of Haydn, also available from Naxos on CD, classicsonline.com for downloads and for streaming from the Naxos Music Library, the Kodály Quartet offer performances and recordings of Schubert at budget price which have little to fear from their more expensive competitors. With attractive covers and excellent notes from Keith Anderson, available to purchasers or to those with access to the Naxos Music Library, you cant really go wrong. · Volume 1  Nos. 12 and 14  8.550590  here. · Volume 2  Nos. 10 and 13  8.550591  here. · Volume 3  Nos. 3, 7 and 9  8.550592  here. · Volume 4  Nos. 1, 4 and 8  8.555921  here. · Volume 5  Nos. 2, 6 and 11  8.557107  here. 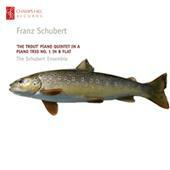 · Volume 7  No.5, Quartettsatz, String Trio, D471, 5 Minuets and Trios, D89  8.557126  here. All those which have been reviewed on MusicWeb International have been well or very well received. 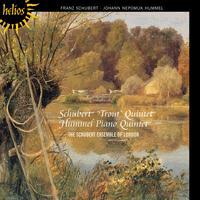 Those who prefer period instruments will find the Quatuor Mosaïques recording of Nos. 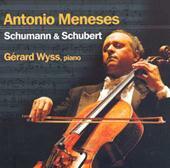 10 and 13 in mp3 (Auvidis E8580) at classicsonline.com  here  or stream from Naxos Music Library. The problem with performing Schuberts Arpeggione Sonata is that no-one makes and almost no-one plays the beast nowadays  its gone the same way as Vivaldis tromba marina and Haydns baryton. The usual solution is to transcribe the music for cello or, more rarely, for viola. I cant offer you a recording with the arpeggione, but either of these versions will do nicely. Go for the Onyx if, like me, you prefer period instruments  a rare outing for Wispelwey denying myself the glossiness and comfortable reliability of steel strings and a Steinway in favour of poetry and expressiveness  and/or if you would like to have access to an informative set of notes. Actually, you can access those notes via the Onyx website  here. Wispelwey and Giacometti are also slightly faster in all three movements. Moreover, while there are many recordings of the Schumann works on the Avie recording, I fell in love with the arrangement of the Fantasy in C (originally for violin and piano), with its variations on the beautiful Sei mir gegrüsst in the andantino. All of which must not be taken as disparagement of Meneses and Wyss, who merit all that Michael Cookson says of them. If youre looking for the classic version of the arpeggione sonata from Rostropovich and Britten (Decca Originals 475 8239, with Schumann Fünf Stücke and Debussy Cello Sonata), that can be downloaded in mp3 and flac from deutschegrammophon.com or in mp3 only, but less expensively, from hmvdigital.com. Both also have the version by Maisky and Argerich. 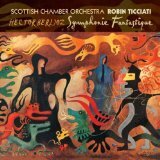 The Symphonie fantastique offers a special challenge  its easy to make it sound good and I dont know any bad recordings, but its exceptionally difficult to make it sound great. In the April 2012/1 Roundup Colin Daviss Concertgebouw recording was Download of the Month, partly for the sake of the performance and partly for the quality of Linns Studio Master 24/96 transcription of the Decca (formerly Philips) recording. That Davis recording is one of only a handful that I can think of that does the trick for me. Could Linn pull off the double with their new recording? Right from the opening the recorded quality is excellent  as soft as you could wish yet not so quiet that you need to turn up the volume to a level where the loud passages knock you out. Later, at the other end of the aural scale, the full snarling menace of the March to the Scaffold is extremely well captured, especially the grotesque bassoons to which the excellent sleeve notes refer. The performance gets off to a slow start, but I think thats partly the fault of Berlioz  its all too easy for newcomers to be put off exploring the music further for that perennial disgruntled teenage reason: boring. If only Id had £5 for every time as a deputy head of a large school Id heard that word uttered as the reason why someone had been sent to me for disrupting a lesson! Even Beecham sounds a little tentative, though his is one of the versions that join Davis at the top of the pile. When Berlioz gets underway, so does Robin Ticciati and the same is true in the second movement. The third movement, scène aux champs, provides an interlude of peace between the whirling ball and the horrendous march to the scaffold, with Beethovens Pastoral Symphony no doubt in Berliozs unconscious. I thought it a little too placid in the new recording, to the extent that I thought that this must be one of the slowest accounts of the movement  only to be surprised to discover that, of my short-listed recordings, only Immerseel is slightly faster: Beecham takes longer (16:57 against 16:17) and Dutoit longer still (17:15). In the march to the scaffold Ticciati neither lingers nor hastens  at 6:35 hes not one of the fastest marchers  Beecham takes just 5:18 and makes it sound energetic and menacing but not too hurried. Hes not the slowest either, with van Immerseel a whole minute slower. The extreme range of tempi shouldnt make sense  Dutoits Philharmonia recording, faster even than Beecham at 4:37, extends that range even further  yet somehow all three manage to convey the snarling menace of the music here; in the case of Immerseel and the new recording the use of smaller forces helps, the drum strokes coming through more clearly for example, with Immerseel also having the benefit of period instruments. Standing on the middle ground isnt always a virtue, but it is for Ticciati here, especially when Colin Davis with both the LSO and the Concertgebouw adopted a very similar timing. Yannick Nézet-Seguin with the Rotterdam PO stands on exactly the same middle ground in this movement  just three seconds slower than Ticciati  but Dan Morgan thought his performance foursquare and uncompetitive (BIS-SACD-1800  see review). To be fair, Im not quite as critical of that performance, though Ive heard it only from the Naxos Music Library  perhaps Dan was put off by the low-level transfer of the SACD layer of which he complains. Ticciati is a trifle slower than Davis with the Concertgebouw in the witches sabbath finale but theres no shortage of voltage in the new performance, and the recording brings that out to the full  the end really does sound cataclysmic. Daviss latest recording with the LSO on their in-house label is marginally slower than Ticciati. In both recordings the bells sound more effective that Immerseels pianos, though the latter arrangement apparently had Berliozs support, if only for occasions when suitable bells were not available. The Overture sounds an irrelevance after that: it registers as merely pleasant  try to programme it to play first  but it receives a good performance. · French National Radio O/Beecham  EMI 5099991870957 (with Le Corsaire and excerpts from Les Troyens: May 2010 Roundup) [ignore now invalid passionato.com link  download from classicsonline.com (mp3)] Also available as part of The French Collection on 5099990993251  from classicsonline.com. 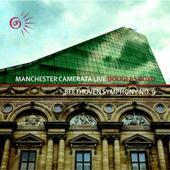 · LSO/Davis  Philips Eloquence: still well worth considering  download from hmvdigital.com. All the versions listed do justice to this incredible work but Beecham remains top dog for my money  even in mp3 the re-mastered EMI recording hardly shows its 50+ years, even heard directly after the new version in Studio Master. If its period instruments that you want, it has to be van Immerseel on Zig-Zag. The new Linn version doesnt quite challenge those recommendations, but its the only option available in (very good) Studio Master sound and its not far behind. I didnt think the Scottish Chamber Orchestra could pull it off now that Charles Mackerras is no longer with us and them, but I think their new recording would have earned his approval. Not quite a double first for Linn, then, but a very good 2:1. I praised the Hyperion recording when reviewing the Beulah reissue of the 1928 Myra Hess/Jelly dAranyi/Gaspar Cassado of Piano Trio No.2 in the July 2011/1 Roundup. 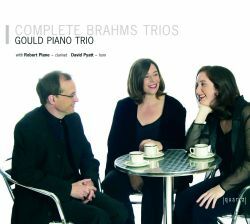 Hyperion bill this as all of Brahmss Trios assembled on two CDs but Quartz see it rather differently  on three discs they offer both the original and revised versions of Trio No.1 and to the regular trios they add a posthumous work in A without opus number which may or may not be by Brahms. Both sets offer excellent performances, well recorded. If you require completeness, the Quartz recordings will do fine and they come in good mp3 sound  the bit-rate is only 192kb/s, but sounding fine. For the full-cream 320kb/s you need to download from classicsonline.com, where the single CDs cost £7.99 against Quartzs £4.99 and the 3-CD set £23.98 against £4.99 from Quartz. No, thats not a typo  the 3-CD set really does come from Quartz at the same unbelievably inexpensive price as the single CDs. If you want lossless sound, Hyperion can provide that at no extra cost and theres a pdf booklet to download and print if you wish. Those Hyperion notes are offered free to all comers, however, so its worth obtaining them even if you go for the Quartz download. Youll find notes by Mike George, Joanna Wyld and Richard Whitehouse on the Quartz web page; click on sleeve notes  you cant save or print them as a booklet, as you can with the Hyperion, but you can cut and paste and then print or save as a pdf document which you can then drag to the same folder as the music files. Aarhus Symphony Orchestra/Bo Holten  rec. October and December 2011. DDD. 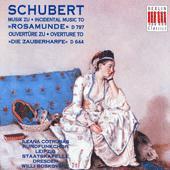 DANACORD DACOCD721 [74:17]  stream from Naxos Music Library. I havent yet heard those earlier volumes but its been well worth the wait for the current release. There are several other fine versions of the Songs of Sunset* and North Country Sketches, but not coupled together as here, except on an EMI 18-CD set  see review. 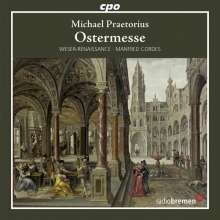 With fine performances, good recording, even as heard via the Naxos Music Library  the classicsonline.com release should sound better when it appears as it must soon  and excellent notes, this is strongly recommended. Amazon.co.uk have the download for £7.49 but without notes and presumably at only 256kb/s. * not least, of course, Beecham on the Delius-dominated 6-CD EMI collection of English Music which was my Bargain of the Month in the July 2011/1 Roundup  see review. Holten is just a little more relaxed than Beecham. Piers Lane (piano)**  rec. June 2011. DDD. HYPERION CDA67927 [59:10 + 23:45]  from hyperion-records.co.uk (mp3, 16- or 24-bit Studio Master lossless). This May 2012 release can be pre-ordered or downloaded in mp3, 16-bit lossless (both at £7.99) or 24-bit Studio Master quality (at £15.60) before its release date. The availability of some recent Hyperion downloads in Studio Master versions is an exciting development and brings them into line with the likes of Linn, Gimell, Channel Classics and thesixteeendigital.com and at a slightly lower price than the Studio Masters on those labels. My review for the main MusicWeb International pages was based on the 16-bit version for the sake of parity with the CD, but I also listened to the Piano Quintet in Studio Master format, about which see more below. We have become almost spoiled for choice in the case of Hartys orchestral music, though the very skimpy article in the Oxford Companion to Music still seems to regard his arrangements of Handels Fireworks and Water Music as his greatest achievements. His chamber music has been pretty well a closed book heretofore. Though these are not claimed as premiere recordings, I cant find any rivals in the current catalogue and I dont remember ever having encountered any, despite pleas in the letter pages of Gramophone for these three works. Perhaps their failure quite to squeeze onto one CD has been the problem  very remiss of the composer not to foresee this  but Hyperions 2-for-1 arrangement neatly solves the problem. With the download, of course, theres no need even to change discs. We must thank the Australian Council for the Arts  thankfully nothing to do with Barry Humphreys Sir Les Patterson cultural attaché persona  for their sponsorship of antipodeans Piers Lane and the Goldner Quartet in this music. All three works are early pieces and I cant claim that Hyperion have uncovered lost treasure, though the Piano Quintet is a strong work which in several respects pre-echoes the Elgar Piano Quintet. Im not sure that it merits the description which Hyperion offer in the blurb on their web-page  a lusciously big-boned work worthy of Tchaikovsky  but it receives a robust performance here which brings out its qualities very effectively. Theres exuberance and a hint of Irishness in the vivace second movement and a lovely winding melody in the lento third movement where, again, the pentatonic mode is suggestive of folk music, slightly wistful Celtic folk in particular, though no actual folk source exists; its all of Hartys own making. Neither of the outer movements is of quite the same quality, but I shall certainly return to this attractive work, perhaps when relaxing at the end of a trying day. 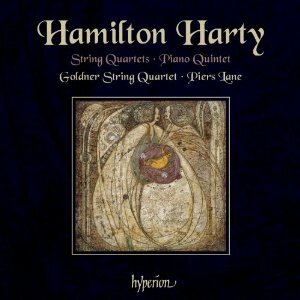 Piers Lane and the Goldner Quartet have already given us the Elgar Piano Quintet and String Quartet (Hyperion CDA67857  see review in which John France characterised this recording as perfect). The first time that I heard their Elgar I thought them a little lacking in intensity, but a second hearing dispelled all but a lingering reservation  see my July 2011/2 Download Roundup  and I think repeated hearing will do the same for their Harty. I have no benchmarks here as I did for Elgar, but I characterise their performances, here as there, primarily in terms of warmth and tenderness of expression. The two quartets are less interesting than the Piano Quintet but they too benefit from performances which seem to be idiomatic and which certainly bring out the appeal of the music. The outer movements of No.2 are particularly ear-catching. The recording is very good, with a generally good balance in the Quintet  the piano perhaps a little too prominent for some tastes. I also listened to the Studio Master version of the Quintet; though I didnt expect to find too much difference, the proof of the pudding was in the eating  a firmer piano tone in particular, though the strings benefit too, and a better balance between piano and quartet. Its twice the price of the 16-bit download but I think you will appreciate the difference if you have a good amp and speakers, and, though its expensive, Hyperion charge a little less for their Studio Masters than most other providers. Jeremy Dibbles notes are a trifle erudite  Im not sure that all his readers would understand a Neapolitan B major and its dominant F sharp  but, as the author of a forthcoming book on Harty, one to watch out for, hes clearly authoritative and hes very informative. Piers Lane and the Goldners have already given us some desirable Hyperion recordings of Bloch (CDA67638  see review), Dvořák (CDA67805  see review) and, not least the Elgar Piano Quintet to which Ive referred above. Im grateful for their latest offering. rec. Lady Chapel of Ely Cathedral and Lincoln Cathedral, 1-6 July 2011. DDD. · The St. Pauls Service and Take him, earth, for cherishing are available on a 2-for-1 Dyad (CDD22038), with the Mattins canticles from the Collegium regale setting  an attractive recording from 1987 and 1989 with St Pauls Cathedral Choir and John Scott. · The Hymn for St Cecilia and Salve regina are contained on CDA67494, performed by Wells Cathedral Choir directed by Malcolm Archer  see June 2011/2 Roundup. Much of the music here relates to the deaths of President Kennedy (Take him, earth) and Howells son Michael (Requiem and All my hope). For the Requiem there are some fine rival recordings on Naxos 8.554659 (St Johns College Choir, Cambridge/Christopher Robinson, with other music by Howells, including Take him, earth) and Collegium COLCD118 (Cambridge Singers/John Rutter, music by Howells and his mentor, Stanford). I recommended both of these, together with a number of other Howells recordings in the June 2011/2 Roundup, including another Hyperion recording of the Requiem, at budget price (CDH55220, Corydon Singers/Matthew Best, with Vaughan Williams Mass and Te Deum). At the risk of causing confusion, I have to say that the new version of the Requiem is every bit as good as those rival versions, the recording excellent and the booklet first class. Choice of coupling must be your deciding factor, but do obtain at least one version of the Requiem. 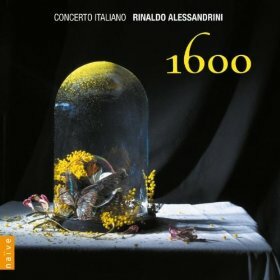 Im currently working on an instructive CD from the Concerto Italiano and Rinaldo Alessandrini, simply entitled 1600’ and containing some of the earliest music composed for instrumental ensemble separately from accompanying vocal performances. Its main value will be for academics to demonstrate the development of Italian instrumental music in the 17th century, but theres plenty for the rest of us to enjoy: Naïve OP30531 [66:43]  download from hmvdigital.com or stream from Naxos Music Library, complete with booklet if you cant wait for my full review to appear.